The skies are one of my favorite things about living in Texas. They’re huge. They never cease to amaze me. I’ve always been partial to sunsets and sunrises, but the daytime skies here really are worthy a of look up. This past Saturday was a beautiful day in north Texas. It was warm and breezy without being hot and windy. We also had some interesting cloud formations. I snapped the above photo from the car with my iPhone. I’m a bird person, which was what made me take the photo to begin with. They look like feathers to me. Massive feathers floating in the sky (imagine the size of that bird) ha! Just when I think I’ve seen all the clouds something like these come along. It was wonderful. It was a reminder to never take your situation for granted. I drive up and down the same roads most days. Everyday the skies have something different to share. And sometimes they have something you’ve never seen before. 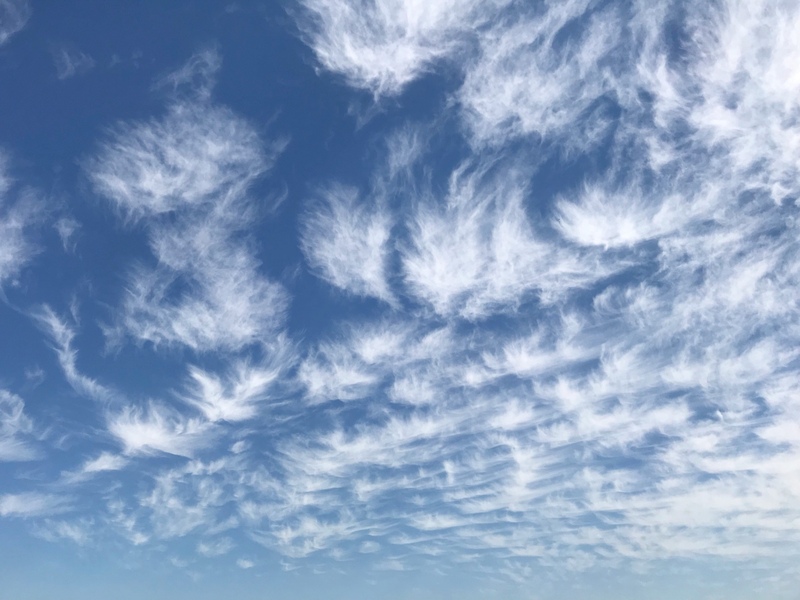 Later that evening, watching the news, I learned they were called cirrus floccus clouds. Thanks to local weatherman, Jesse Hawila of WFAA, for the info. Keep an eye out. Stop and look around. You never know what’s going to show up and make you smile.